UKGE this year has been widely hailed as a massive success. The catering collapsed, Bring and buy could not cope but 99% of attendees and traders recognize these issues were created by the sheer and unpredictable growth of UKGE. This then my friends is the challenge and opportunity that UKGE presents. The year before the first expo a few of us (of which Pat and I are the remnants) helped run a 200 attendee event which, unless you played D and D Minis, Fow or Warmachines would have passed you by. 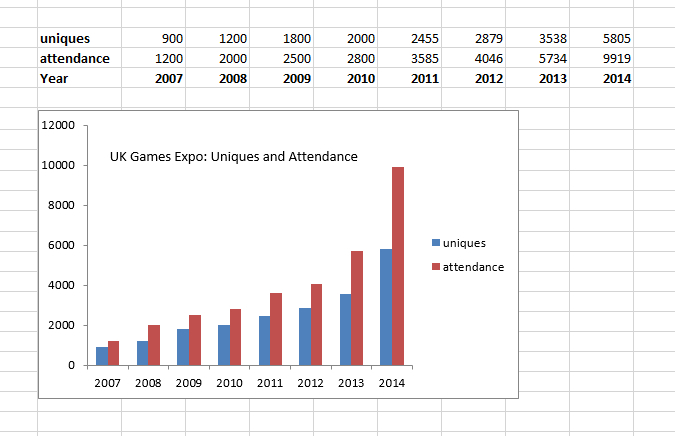 It was the root of the first expo however and led to UKGE 2007. That first year we had maybe 1000 individuals and attendance of maybe 1200. Through the first 6 years growth was 20% or so a year. Last year uniques went up by 25% and attendance jumped by 50% and this year the jump is more like 60% to 70%. This is exiting dizzy stuff and the possibility of an event of true international standing with over 10000 attending is not the pipe dream it was in 2007. BUT there are issues. The Hilton can only hold a certain number. Even with a properly constructed and heated marquee the size of the Kings capacity will outstrip demand very soon. It is clear that we organizers along with our main partners and sponsors need to do some serious thinking. There are options that many of you have already suggested: bringing in nearby hotels for some events, the new build across the lake, the NEC but the reason why we are thinking hard is we don’t want to loose that buzz, that excitement and vibrancy. Hopefully you will all help us maintain that whatever the final plans are. We will be at the Hilton next year with “additions” and many modifications and will keep you in the loop just as soon as the loop exists. I have recently moved with another event to the Ricoh Arena just down the way in Coventry, it is a fantastic venue. They were really helpful and as its a football ground used to large crowds, with ample parking. The best thing is that it is several decent sized rooms off a “main street” with the food areas. I would certainly consider them should you wish to move venues, remain in the Midlands, without going to one giant hall like you would with the NEC. WE have visited the Ricoh during the Insomnia event. Whilst it is quite large it struck us as a somewhat awkward arrangement of rooms. But what makes it so unlikely we could use it is that the hotel ONLY has 110 rooms. the Hilton has over 700 and all were in use over the UKGE weekend and we know that the Plaza and other hotel rooms were also in use. The nearest other hotels to Ricoh are 10 to 15 mins away. That makes it pretty much a none starter given the type of event we are ADF our client base many of whom want to stay onsite or close by..